One of the biggest days of the year for the man in your life is upon us: The Super Bowl. Whether you’re rooting for the Falcons, the Patriots, or the commercials, there’s no doubt that you’ll be watching TV this Sunday. With that being said, you may find yourself suckered into hosting a watch party if both your TV and living room are large enough. (Bonus points if your man told you about it last minute this weekend!) Lucky for you, I’ve got some sweet secrets for you, straight from my main man himself. Whether you’re hosting an intimate gathering or a large party, I’m here to help you keep the stress low and the food coma probability high. 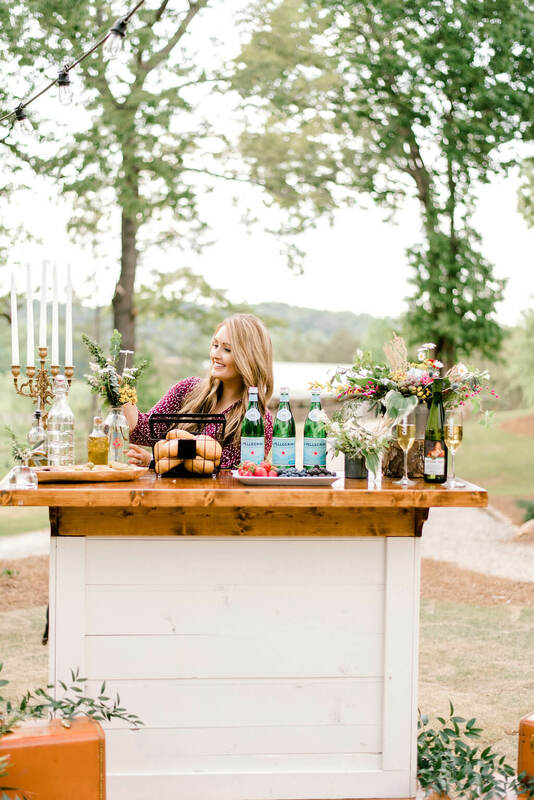 When it comes to hosting a party that is attended mainly by men (and the wives they’ve dragged along), things are a little different. Their first priority is the TV size (bigger the better! ), food (what diet? ), and beer (also, more the better!). Unlike women, they don’t necessarily care about decorations or the details, because they’ll be looking at the TV or down at their plates. Switch your set-up focus from decorations and dressing up your home to optimizing your space for ultimate functionality. One of the biggest things my husband dislikes about going to a watch party at someone else’s home is when there’s not enough good seating in the living room. There’s either not enough comfortable chairs, room on the couch, or some people are stuck off to the side and watching the game at a weird angle. Get your friends excited about the game by arranging your living room seating into almost a crescent shape with the focal point of the room being the star of the show – the TV. Station your coffee table in the center of the crescent and your end tables strategically between chairs with plenty of coasters and napkins for convenience and to minimize mess. Whether you have your kitchen or a dining room located off your living room, make sure to appoint this closest room as the food station. Bonus points if your home is open concept and this room is directly adjacent. An ideal set-up is a perfect line of sight to the TV so you don’t make your guests feel like they’re missing out on anything by getting up to grab a second round of wings. 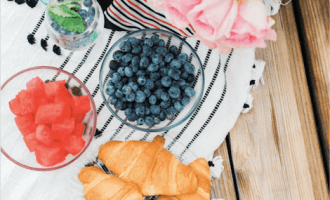 Decoratively stage and display the food and drinks! On your designated dining room table or kitchen island, display all the food and drinks together. 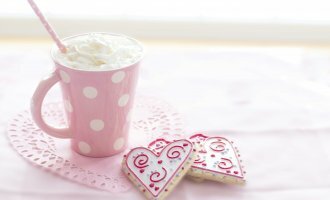 Since you may have opted out of decorations for around your home (that really don’t matter anyways! 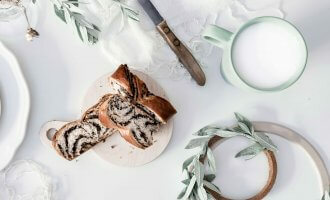 ), take the opportunity to make your space more fun by decoratively staging the food and drinks. This means displaying your food on those platters and serving dishes that you got off your registry and may have not used yet. Get creative and don’t be afraid to be a little cheesy! 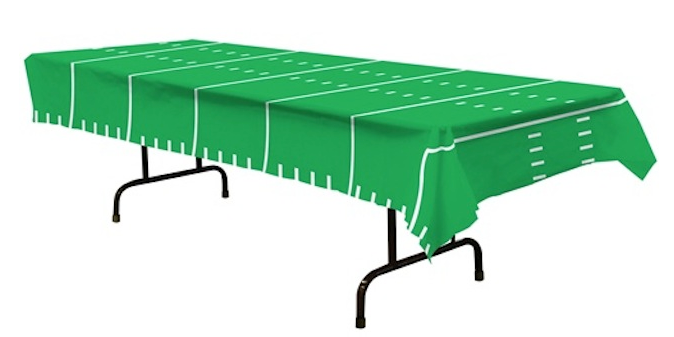 Keep your table safe with minimal clean-up with a football field tablecloth. At a price point of less than $5, you won’t feel bad about just throwing it away afterwards! Every southern kitchen isn’t complete without mason jars. Use a couple of your spare jars as cute, easy utensil holders. Get your head in the game (and the food!) 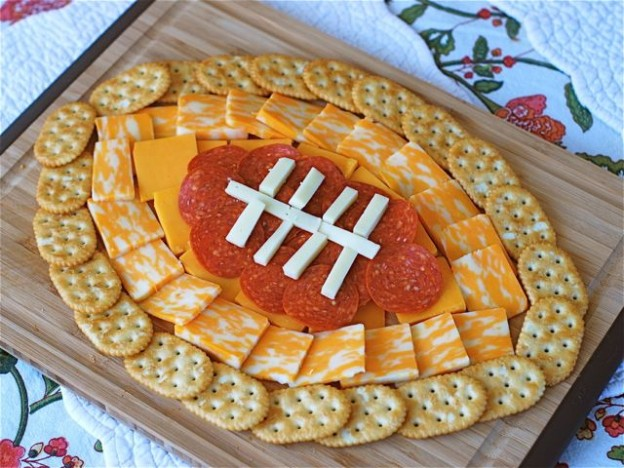 with a football shaped meat, cheese, and cracker plate. But really, a football shaped anything! 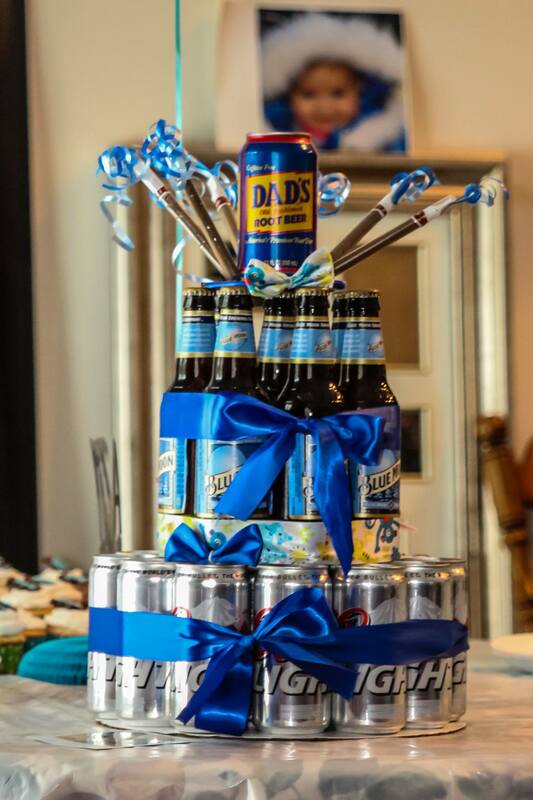 This will be the only (beer) cake the men in your life would be excited about at a party. Have the food your friends actually want. Like I’ve mentioned in previous blog posts, it’s almost like science. What foods do you want to eat when you’ve been drinking? Hot, savory, and all-kinds-of-bad-for-you food! 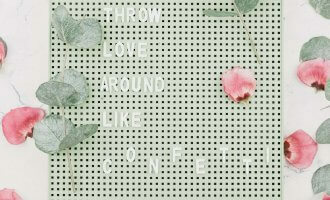 That’s why savory wedding favors are some of the most popular ideas right now! I asked my husband what type of food was essential to a Super Bowl party. Y’all, I literally couldn’t stop laughing at his answer. Think of a typical male response, and you’ll know what my husband had to say. “Don’t give me that healthy kale and quinoa bulls@$*t mamacita, I want that good good food.” -My Husband, Everyone. 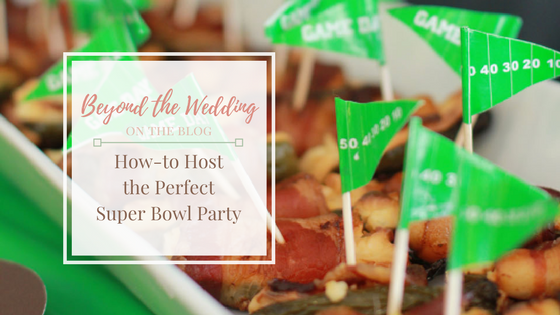 His super bowl party must-haves? Beer – with plenty of variety to make everyone happy! Wings – hotter the better! Queso – of some sort! 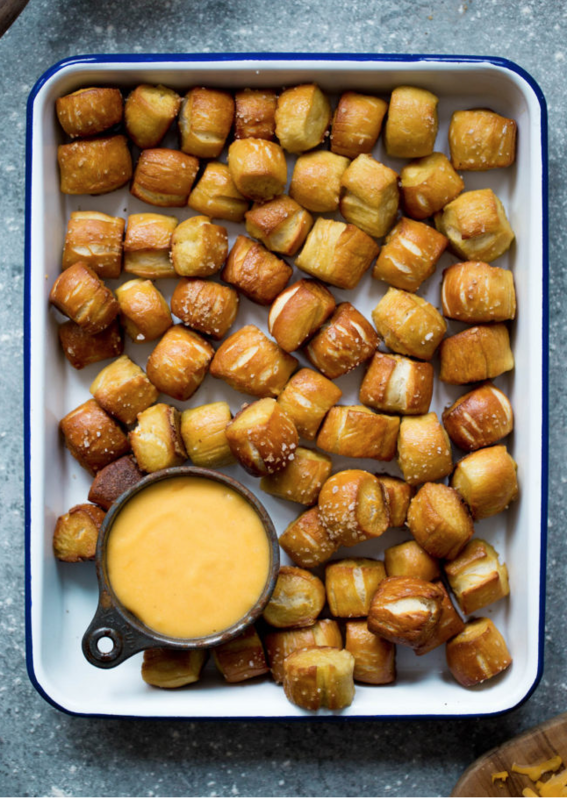 What’s better than pretzel bites and beer cheese? Nothing. The answer is nothing. 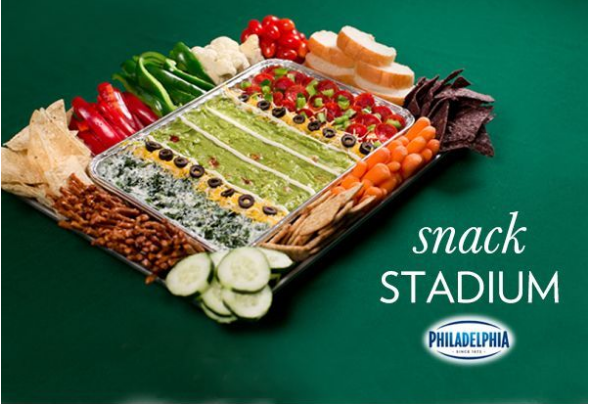 Bonus if you have a variety of dips like this snack stadium! Jalapeno ‘Something’ Dish – whatever it is, make it spicy! Our favorite? 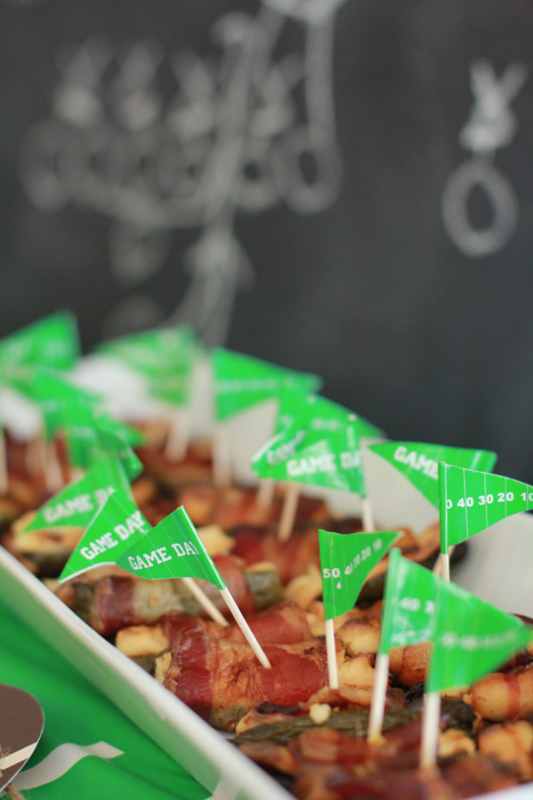 Bacon wrapped jalapeno poppers! To be honest, you can do anything you want for your Super Bowl party. (You do you, boo boo!) However, keep all this in mind while you plan your party. I promise you’ll be everyone’s best friend come game day – regardless of who’s team they’re rooting for!